The Westin St. John is officially open for business! 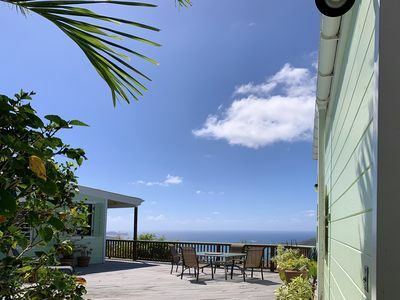 Contact me for a week starting May 10, 2020 including Memorial Day or Carnival and 4th of July week in our luxurious premium 2 BR Sunset Bay Villa in warm, beautiful and sunny St. John! 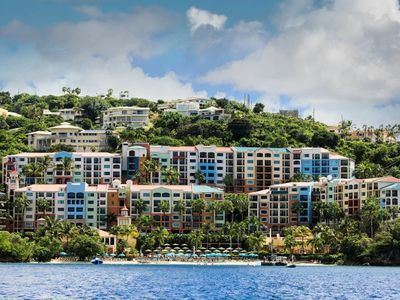 The Westin St. John Resort was closed and completely rebuilt with all new furniture, TVs, and upgraded internet service in 2018 following the 2017 hurricanes. 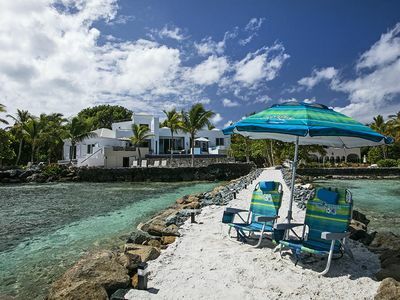 Sunset Bay Villas are comprised of 6 buildings surrounding the resort's huge swimming pool and are just steps from the beach; two of the buildings are oceanfront. 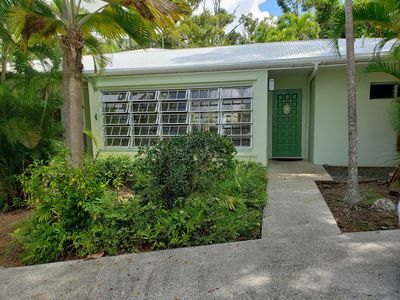 Rent with confidence from a long time owner, not with a property manager, agent or broker. 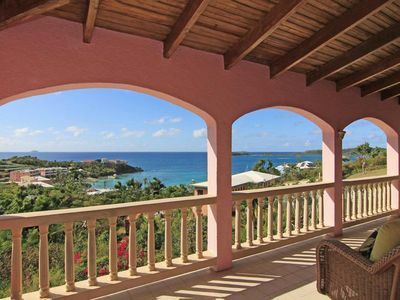 -Spacious villa with 781 Square Feet / 73 Square Meters sleeps eight adults. 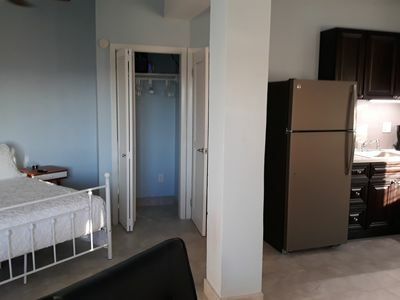 Square footage is approximate and Queen-sized bed in ADA villas. Villa amenities are subject to change. 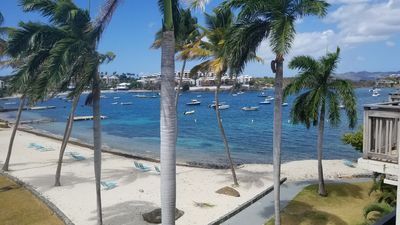 GREAT CRUZ BAY - Sink your toes in the sand and gaze out over Great Cruz Bay along a pristine, 1,200 foot-stretch of beach just steps from the resort. 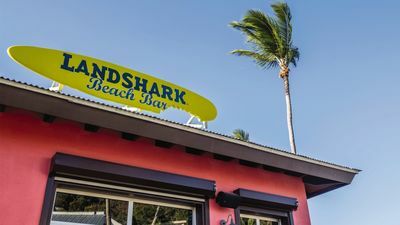 You can relax under palm trees in a lounge chair with an umbrella and treat yourself to a tasty sandwich or frosty beverage from Snorkels—delivered straight to your chair. -SWIMMING POOL – Spend unforgettable days relaxing in the sun and water at the bayside resort pool. Sparkling waters plus convenient poolside food and beverage service make this a slice of paradise. OUTDOOR WHIRLPOOL SPA - Near the pool and surrounded by lush tropical foliage, enjoy a soothing retreat from exploring the island. It’s also the perfect setting to savor a sunset cocktail. WATERSPORTS - Cruz Bay Watersports, located on the beach, has Kayaks, Aqua Bikes, Sunfish and Hobie Cats for guests who are ready to hit the waves. Guests can also book excursions at sea directly from the dock. Go snorkeling or scuba diving and discover the secret caves of the British Virgin Islands with a stop at Cooper Island for lunch. 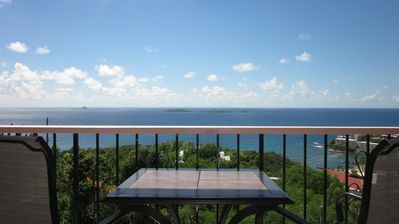 Or, sip champagne and savor hors d’oeuvres on a sunset sail through the Caribbean. Fees apply so be sure to check the Cruz Bay Watersports Facebook page for specials. -WESTINWORKOUT® FITNESS STUDIO - A wall of windows with refreshing courtyard views will inspire a workout any time of day. All new Life Fitness machines help you improve strength, flexibility, balance, and aerobic conditioning, while yoga, Pilates, and water aerobics classes bring a social aspect to your fitness routine. Complimentary towels, water, and headsets are provided for your convenience. 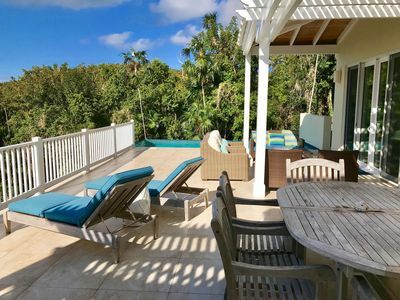 -RESORT SPA – The luxurious spa offers a comprehensive menu of massages and body treatments to help you unwind and embrace the slower island pace. 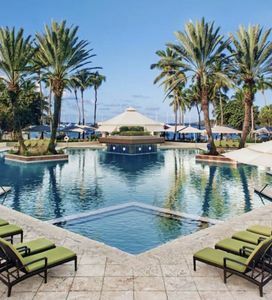 Choose to experience your treatment amid the idyllic setting of a poolside cabana or the privacy of one of the individual treatment rooms, where attentive and skilled therapists will leave you feeling renewed and refreshed. (extra fee for cabana rental). In Villa treatments also available by request. -WESTIN® FAMILY KID’S CLUB is open Daily: 8:30 a.m. – 10:00 p.m. Westin Family Kids Club keeps children entertained with fun and educational activities that bring island culture to life for children ages 3 – 12. A variety of locally inspired activities are prepared by the experienced and award-winning Westin Kierland FUN Team. Fees apply. 24-hour advance reservations are required. Advance reservations for Parent’s Night Out are also required. Please note that children must be fully potty trained to participate. Right on the sand, just steps from the pool’s sparkling water, is Snorkels Bar & Grill. Enjoy the shade of palm trees while you sample from a variety of fresh, Caribbean-infused cuisine for breakfast, lunch and dinner. Stop by Mango Deli for quick and healthy grab-and-go meals and gourmet deli items. Freshly brewed Starbucks coffee is available each morning, along with local pastries, fresh fruit, and other tempting fare. Pick up a made-to-order sandwich or wrap for lunch, or dinner. Mango Deli also sells a variety of wine and beer. In-room grocery delivery and pre-stock service will also be available. 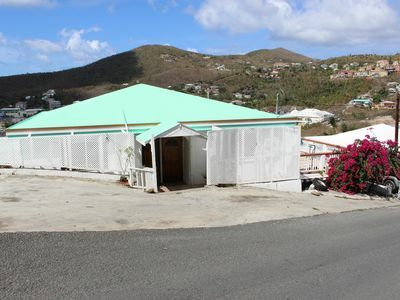 -Off property, St. John Market & Deli is within walking distance of your villa for more grocery options. 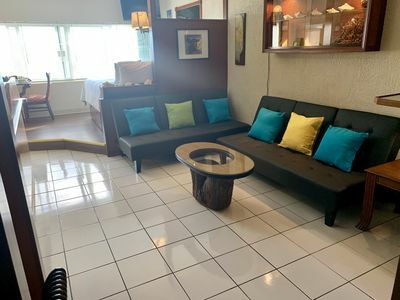 -Onsite concierge available for reservations and arranging tours and activities. 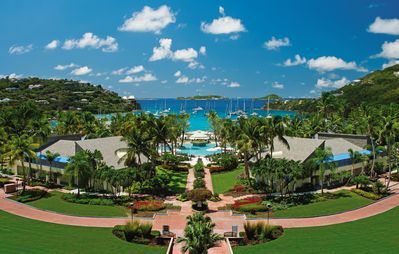 With two-thirds of the island set aside as national parkland, St. John is the embodiment of natural beauty and home to The Westin St. John Resort Villas. 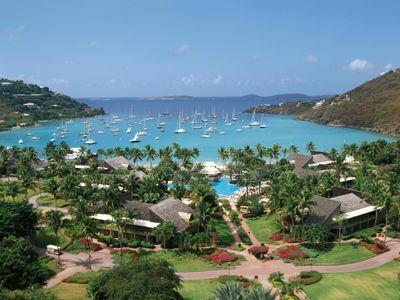 From the moment you arrive on the white-sand beaches of Great Cruz Bay, you’ll be swept away by this 47-acre paradise, offering distinctive amenities and services all framed by picture-perfect Caribbean ocean views. St. John is home to some of the most beautiful beaches in the world, including Trunk Bay Beach, accessible by a quick taxi ride to the North Shore. 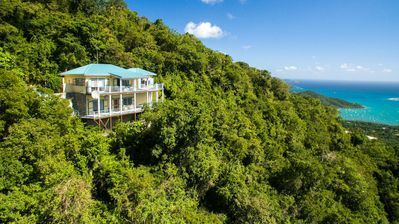 After you book, you'll have the option of taking public taxis and ferry from the island of St. Thomas to the resort on St. John or booking the resort transportation for an extra fee. 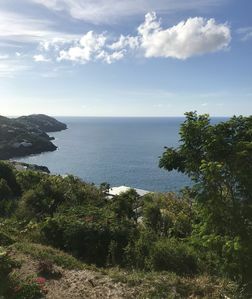 In September 2017, The Westin St John Resort and much of the island were devastated by Hurricane Irma with Hurricane Maria following soon after. The resort has been closed for all of 2018 to repair and renovate the property back to its beauty. 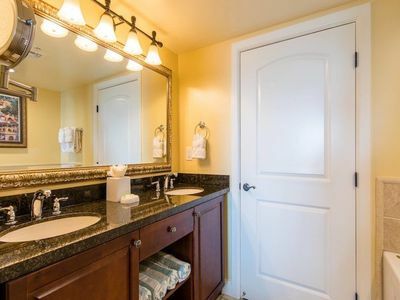 Villas and amenities may differ from photos based on these renovations. Resurfacing of the tennis courts is scheduled to be completed in May. 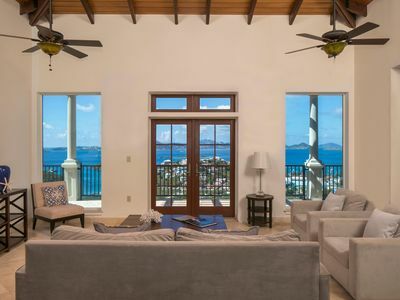 The rental rates include all taxes and fees EXCEPT for a $25 per day Virgin Islands Environmental and Infrastructure Fee that the Westin will collect at check-out.